Healthy snack or light dessert? You decide! 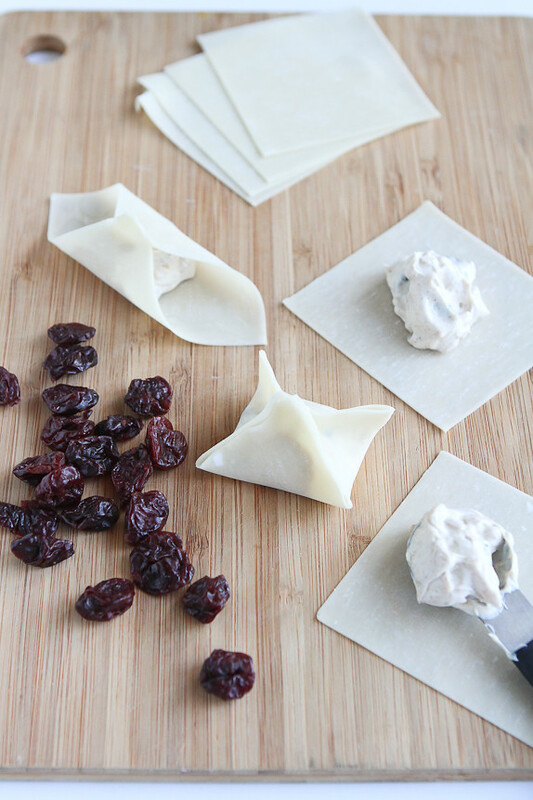 Either way, these Baked Tart Cherry & Cream Cheese Wontons will disappear in a flash. Thank you to The Cherry Marketing Institute for helping me to share this recipe with you. My eldest son (M) is about to reach a milestone in his young life, and I’m not handling it very well. Over the past 4 months, he has shot up several inches, passed by his “5 foot and shrinking” (her words) grandma, and he and I are now looking eye-to-eye. Well, almost. I still have about an inch on him, and I’m holding onto that tightly. This is the little boy that, just yesterday (I swear! ), I was holding in my arms and who called me “Mummy” in his sweet toddler voice. I’m learning to embrace this new stage of independence, sweaty socks and the “parents aren’t too bright” attitude. As long as M snuggles in for the occasional hug, I can deal with the teenage eye rolls and even with him growing taller than me. And he’s not the only one who’s growing. My younger son is sprouting like a sunflower, though he still has a couple of years to go before he catches up to me. At least, I hope he does. Growing boys mean growing appetites, and I’m shocked everyday at the amount of food they can put away. By the time they come home from school each day, they’re ready to raid the fridge, so I try to have something tasty and healthy on hand for quick refueling. 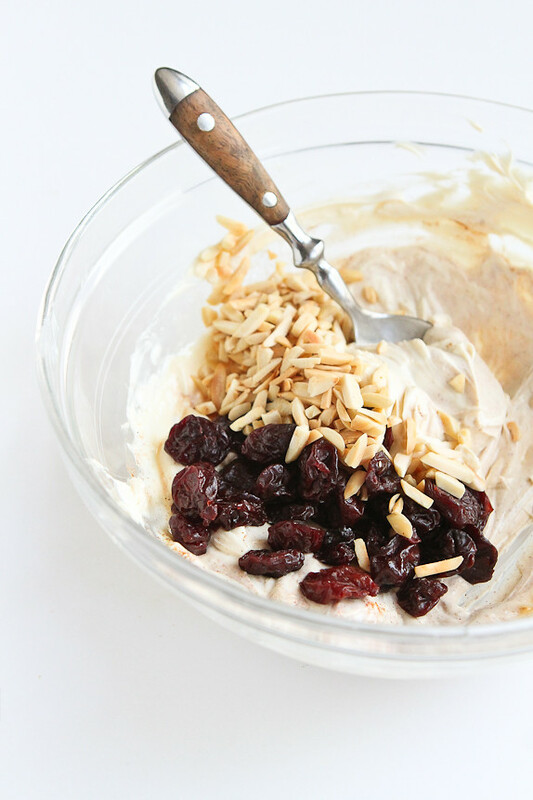 Tart cherries are always in our pantry and the boys often grab a handful of tart cherries and raw almonds, or some Curry Spiced Nuts with Dried Cherries if I have them on hand. To celebrate the boys being back to school, I wanted to come up with something special for them to dive into at the end of the school day. 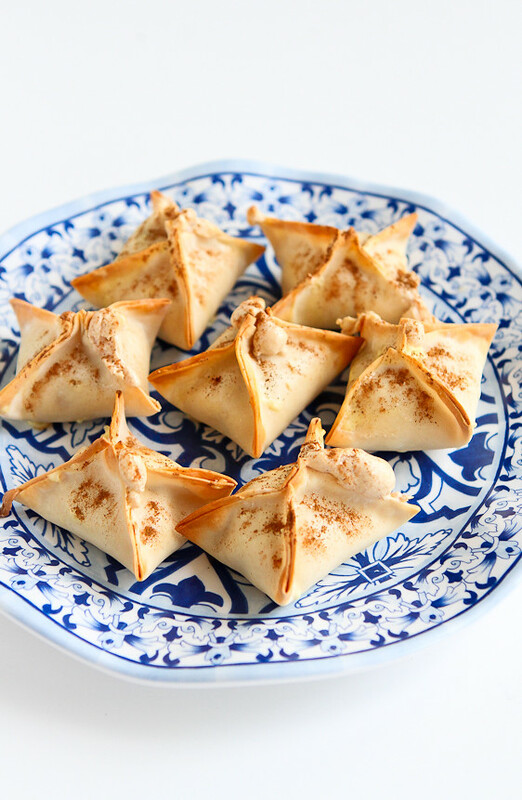 These baked wontons may look fancy, but they couldn’t be easier to make. Just whip up some softened cream with a little maple syrup and cinnamon, stir in some tart cherries and toasted almonds, fill some wonton wrappers with the mixture and bake them in the oven. I made 12 of these little guys on the first go-round and my boys had inhaled them within 10 minutes of walking through the door. They were a huge hit! They are healthy enough to serve as snacks, but sweet enough to sub in as dessert after dinner. Not only are tart cherries great to have on hand as a snack food, but they have a laundry list full of health benefits. For example, tart cherries contain Vitamin A and anthocyanins, which are antioxidants that have been linked to decreases in inflammation, which can help to soothe arthritis symptoms and ease exercise-related muscle pain. Tart cherries can be found in well-stocked grocery stores, as well as healthy food stores, such as Whole Foods. We always have tart cherries available in at least two forms in our house, and we use them daily on top of cereal and in baked oatmeal. For more information on tart cherries and recipe inspiration, be sure to visit the Cherry Marketing Institute site, and follow Choose Cherries on Facebook, Twitter and Pinterest. Healthy snack or light dessert? You decide! 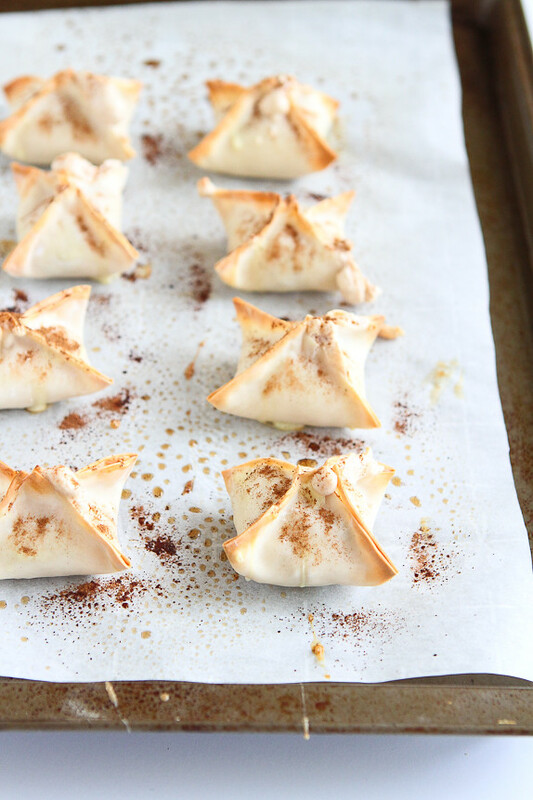 Either way, these Baked Tart Cherry & Cream Cheese Wontons will disappear in a flash. Preheat the oven to 350 degrees F. Line a baking sheet with parchment paper and lightly coat with cooking spray. In a medium bowl, whisk together the Neufchatel cheese, maple syrup and cinnamon until combined. Stir in the tart cherries and slivered almonds. Working with a few wonton wrappers at a time, place about 2 teaspoons of the cream cheese mixture in the middle of each wonton. Using your finger, rub a small amount of water on the border of the wonton wrapper. Pull the corners of the wrapper into the center and press together. Also press together the open sides to seal. Place the filled wontons on the prepared baking sheet. Bake until golden brown, 15 to 18 minutes. Whisk together the egg and water in a bowl. Brush the wontons with the egg wash and sprinkle with the ½ teaspoon of ground cinnamon. Return to the oven and bake for 4 minutes. Serve. Disclosure: This post was written as part of an ambassadorship with the Cherry Marketing Institute. All opinions are my own. Kids do grow up too quickly. This sounds like a tasty treat to have on hand anytime. I wish my mom did awesome things like make these delicious wontons for me when I got back from school! The creamy cheese and tart cherries sound the most magical combo EVER. Pinned! This is such a creative recipe. I could snack on these all day, every day. Pinned. Your boys are pretty lucky to have you as their mom and that you make such awesome after school snacks! I haven’t worked with wonton wrappers before but I’ll have to give it a try! Oh my gosh, I would inhale these!! These look amazing! I love what a creative recipe this is! Any thoughts on how these would work as make a heads for reheating later? They sound delicious and look adorable. Thanks! I love having snacks ready for my kids when they come home from school too and these wontons would be perfect for them – light on sugar but fun and delicious! I know what you mean about kids growing up too fast, I’m now the shortest in my family. My boy is only 4 but I am already dreading the days when he will be too big for me to pick him up! These wontons look fantastic! I love this sweet version! Oh the memories…once my boys hit teenage years it felt like I needed a second job just for the food bill. These look delicious…can’t wait to try…but think they would also be a great pairing to a holiday cheese board!!! My oldest is taller than me and my 12 year old daughter as well! I look like I’ve shrunk when I see pictures of us. At least my 9 year old as some time being shorter than me! 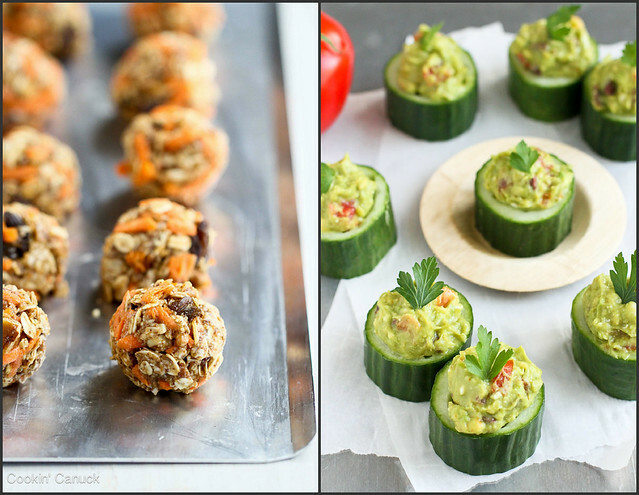 These look perfect for hungry afterschool appetites. My oldest is taller than me and my 12 year old daughter as well! I look like I’ve shrunk when I see pictures of us. At least my 9 year old has some time being shorter than me! These look perfect for hungry afterschool appetites. These are definitely special and so fun! It’s a great back-to-school, after-school treat! Not gonna lie. This plate of these wouldn’t make it past the baking sheet! I have to say that you are a pretty incredible mother Dara, and your kids are sooooo lucky to have you! I love these cute little bundles and how you’ve sweetened them up! Pinned! lol our daughters shoot up a few inches all the time — sometimes overnight. I tear up every time. Well, onto the food, they look amazing! Reminds me of crab ragoon but sweeter and bettter. We love tart cherries too. This sounds like a great after school snack. So of course living in Michigan, cherry capitol of the US, I feel like I’ve experienced all things cherry but girl you have out done yourself!!!! My boys would love this! I need to bake some of these up for an after school snack – my kids would go crazy for them! These look so delicious, I can’t believe they’re healthy. Pinned. These do look fabulous, and what a fun treat! I love having cherries on hand for a variety of dishes — so flavorful and good for you! Dara this is truly amazing and I am totally trying this one next week. I love cherries so this is right up my alley. Beautiful and tasty, it’s the perfect combination. I remember the days both my kids shot up like that. Me and K have a running battle over who is taller. I still say me but she says it’s her. Hubby and son get dragged into weekly comparisons and we stand back to back trying to get the edge by standing as tall as we can. It usually leads to hysterics and silliness. I am, of course, always taller. This is what you make as an after school snack?! Wow. Your boys are so lucky! I love wontons made like this and the cherry and maple syrup on the inside rally makes my mouth water. I think I’d inhale these too. I love the thought of the crunchy outer shell and the creamy and sweet centers! These are so gorgeous, and those flavors sound wonderful! I am such a fan of cherries I need to make these this fall. Love this recipe! To tell you the truth, I am a little nervous for when my boys become teenagers. The amount of food they eat now kind of amazes me. I think I’ll go ahead and buy myself a Costco now 🙂 These wontons look great by the way, loving the cherries! I don’t blame your kids for the quick inhaling of these wontons. They sound awesome tasty! I’m making a mental note; make a double batch because these go fast! How could they not, the filling is divine! These look so darn good, now I want wontons for breakfast.